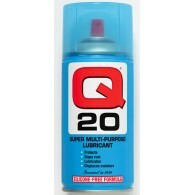 Q20 Leads the pack when it comes to Multi Purpose Lubricants. 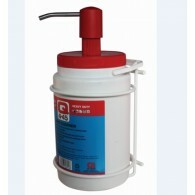 This product displaces moisture, stops rust in tracks, proects and lubricates all household and industrial items. It has the most advances formula. Why Q20? 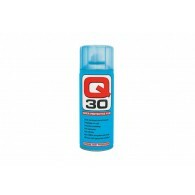 Displaces and prevents moisture in ignition system..
Q30 is a new innovative product. It's a superior protective film used for sealing and protecting electrical connections, hydraulic fittings and exposed surfaces from rust and corrosion which takes place in moist and harsh environments. 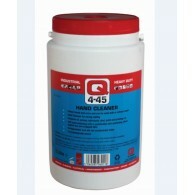 It is fast becoming a must have essential in the marine, electri..
Q4 is an acetone-free cleaning agent with intense penetrating properties for oily and greasy machine parts. Ideal for industrial repairs and assemblies. Q4 Brake Cleaner contains a special blend of degreasing solvents for cleaning brake and clutch system parts without the need for dismantling. ..
Q4:45 is a heavy duty, anti-bacterial hand cleaner that has a built in barrier cream making it suitable for even the more sensitive skin types. This soap can be used with or without water on hands and arms and helps protect against dry and chapped skin. Q4:45 features: ..
Q4:45 Wall Mount Dispenser For 3LTR ..
Q90 are extra large industrial strength hand wipes that contains a high quality liquid hand cleaner formula and a heavy duty, non-scratching, abrasive hand-cleaning towel. 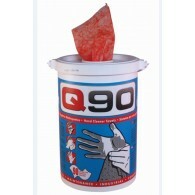 They are fast and effective meaning that you can clean your hands wherever you are, without water, without rinsing, without dryi..